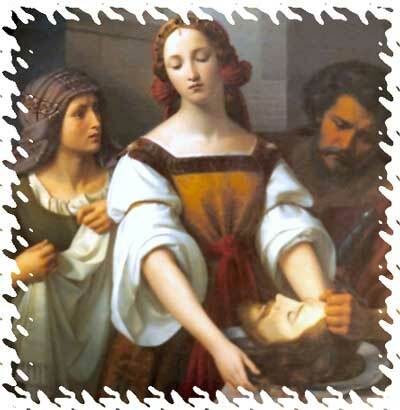 Today Mother Church commemorates the beheading of St. John the Baptist. Everything in St. John the Baptist’s life pointed to Christ. Br. Cassian once prought on this saint during his time at St. Paul’s. He made reference to the Cathedral at St. Paul, MN, where there is a statue of St. John the Baptist pointing to the Sacred Tabernacle. Everything must point to Christ. Although he wanted to kill him, he feared the people, for they regarded him as a prophet. But at a birthday celebration for Herod, the daughter of Herodias performed a dance before the guests and delighted Herod so much that he swore to give her whatever she might ask for. Prompted by her mother, she said, “Give me here on a platter the head of John the Baptist.” The king was distressed, but because of his oaths and the guests who were present, he ordered that it be given, and he had John beheaded in the prison. This entry was posted in Bible, Reflections, Saints. Bookmark the permalink.